Bonhams will be holding “The Marine Sale” on Wednesday, April 15, 2015. 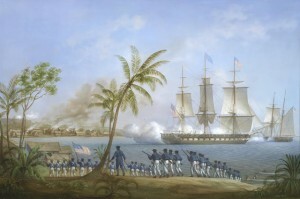 The painting “The American frigate Potomac attacking Malay pirates at their settlement of Kuala Batu, 1832,” is in the marine painting section of the sale. This painting will be in my book, Embassy to the Eastern Courts, due to be published in November 2015 by Naval Institute Press.